Bluetooth speaker from Mpow to enjoy hearing crystal clear audio with great bass. Buy Mpow Portable Bluetooth Speaker Wireless Sports Outdoors Soundbox with FM Radio worth Rs.3405 at Rs.799 only at Amazon which also has FM radio support. 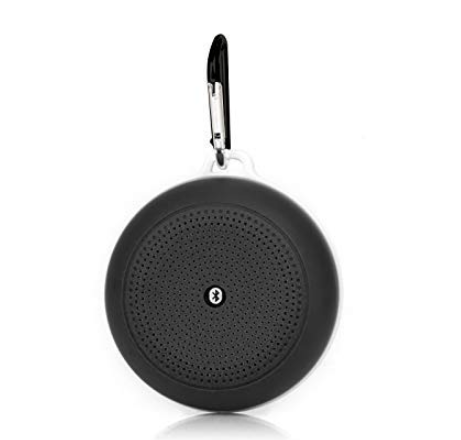 【Multifunctional Bluetooth Speaker】Supports wired/wireless music playback, FM radio, handsfree calls, Aux-in and TF card play. Please note only wireless mode supports music track control, wired mode supports mobile control. 【Handheld Portable Hook Design】Mpow Bluetooth speaker weighs only 130g with a hook, you can put hang it anywhere you want. As large as your palm, suitable for both indoors and outdoors use. 【Advanced Chip, Wonderful Output】4Ω/3W speaker, with Bluetooth audio decoder chip supports all Bluetooth-enabled devices. Just enjoy crispy clear brilliant sound! 【500mAh Battery Life】Mpow soundbox is equipped with super 500mAh battery, you can use it for 3 hours with single 1 hour charge. Wireless range is up to 10 meters. 【Anti-slip Base Durable Use】Mpow speaker has dull-polished base, which is anti-slip and anti-fraction. Thus, it has longer lifespan and make your life more colorful.